As top German politicians continue to negotiate a difficult three-party coalition – the first in the country’s history – the target of 40% lower carbon emissions by 2020 (relative to 1990) looms ominously. The next coalition will be the one to deal with this missed target. And the miss won’t be close. No, the reduction is likely to come in at a mere 30-31% (in German). But let’s take a step back for a moment: instead of being widely celebrated for one of the biggest carbon reductions among industrialized countries, Germany is likely to be called hypocritical. How did this go so wrong? Most articles on this topic will focus on how Germany did not phase out coal. Transport, whose share of carbon emissions has actually grown since 1990, now makes up 18%, just behind industry at 21%. A coal phaseout is arguably the big topic in the energy sector at present – it just won’t happen in time for the 2020 target. 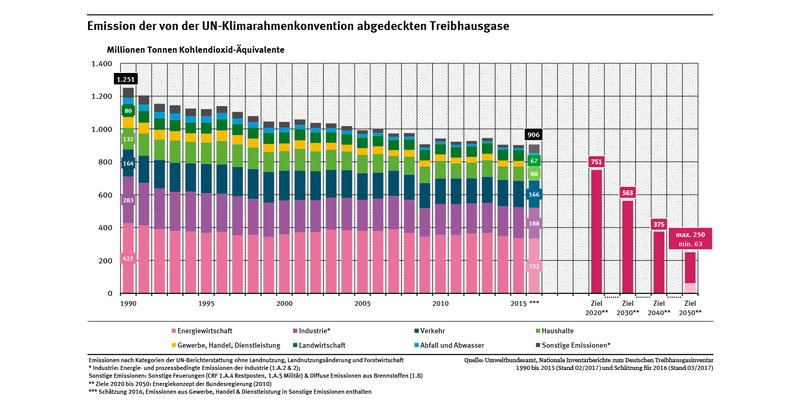 CO2e emissions in Germany. The caption reads: energy sector, industry, transport, households, commerce, agriculture, waste, and other. All sectors are down significantly since 1990 except transport. Source: UBA. But rather than focus on what needs to be done, I’d like to talk about how a country like Germany can set a target so hard to reach. You see, German experts have always said a 40% carbon reduction would be nearly impossible by 2020. It all started in 2007. The EU was discussing increasing its target of a 20% emissions reduction by 2020 to 30% if a worldwide agreements were reached. At the time, the Germans offered 30% in addition to the roughly 10% reduction estimated to have come from cleaning up the East German industrial and energy sectors in the early 1990s. The goal of 40% was thus Germany’s attempt to entice others to be ambitious. After the COP conference in Copenhagen failed to deliver that international agreement in 2009, Germany’s governing coalition elected that year nonetheless stuck to the 40% pledge. One reason may have been the new government’s aim to extend the service lives of nuclear reactors (thereby reneging on the 2002 nuclear phaseout). The nuclear sector has always shown great concern about climate change in the hope that this concern might revive the sector. It was also hoped that the emissions trading scheme ETS would lead to a coal-to-gas switch. Otherwise, no major policy changes were implemented to ensure a 40% reduction, leaving the country without a plan after the 2011 phaseout and the failure of the ETS to bring about a coal-to-gas switch. But even in 2009, experts – such as the German Environmental Agency – pointed out that a 40% reduction “is not possible even if [the government’s plan] is optimally implemented” (p. 53 in this German PDF). Additional steps would be needed, but the government didn’t adopt any. So Germany failed to get other countries to adopt more ambitious goals by offering its own 40% target, which it will now miss by a wide margin. Was this tactic worth it nonetheless? The downside is that, since the nuclear phaseout of 2011, Germany has been drawn a lot of attention in the climate debate. Missing an ambitious target will draw far more criticism than reaching a less ambitious one of, say, 30% would draw praise. (Did you know, for instance, that Germany surpassed its Kyoto target of a 21% reduction by 2012? It came in at 24.7%.) Germany’s reputation as a climate leader may suffer in the early 2020s as a result. The upside? Leading German politicians will probably be embarrassed when the target is so clearly missed. That pressure could lead to slightly more ambitious climate policies. If implemented before 2020, those policies could in return send a signal to other countries that Germany at least isn’t taking its failure lightly. Renewed German commitment to lower emissions might then be a better encouragement to other countries than the unrealistic target was. At present, it’s hard to say how all this will play out. For now, it’s important to understand what targets often are: political poker chips not necessarily based on any analysis. The analysis often follows the target-setting. If missed targets lead to embarrassment, there’s still hope. It’s therefore good to have politicians who can feel shame. Britain cut its greenhouse gas emissions 1990-2016 36%. Why not just cancel the nuclear phaseout? Turn the plants that have been shut down back on? German nuclear power plants are very good, among the best in the world. Use them to save our climate! “Few will talk about agriculture”. As far as I can see the author mixes up the data for Landwirtschaft (agriculture) and Verkehr (transport). The share of agriculture increases slightly from 6,4 in 1990 to 7,4 in 2016, whereas the transport share increases from 10,5 % to more than 18 %. The next target should be the net zero one, following Sweden. The experience of the 2020 failure will make German politicians cautious, which would be a pity. But if it starts a real discussion of what net zero would look like ( e.g. no ICE cars and trucks at all), it’s no bad thing.